Lovage is an ancient herb that was a common staple in kitchen gardens used to cure abdominal pain. While lovage can be propagated from divisions, the most common method is lovage seed germination. Seed grown lovage makes for a gorgeous perennial herb that is a great addition to any herb garden. Interested in growing lovage plants from seed? Read on to find out how to grow and when to sow lovage from seeds. Lovage (Levisticum officinale) is a hardy, long living perennial herb that is native to southern Europe. Steeped in historical reference, lovage could be found in most kitchen gardens during the Middle Ages for use in both cooking and for medicinal purposes. Today, lovage is most commonly used to season soups, stews and other dishes. Lovage is hardy from USDA zone 3 and up. All parts of the plant – seeds, stems, leaves and roots – are edible and taste like strongly flavored celery. Big plants, lovage can grow up to 7 feet (2 m.) in height and actually look very much like a large celery plant. An easy to grow herb, lovage grown from seed should be started in the spring. It can be jump started and sown indoors 6-8 weeks prior to transplanting outside. Lovage seed germination takes 10-14 days. 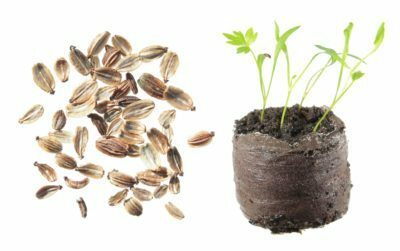 When growing lovage plants from seed indoors, sow seed ¼ inch (5 mm.) deep. Sow 3-4 seeds per pot. Keep the seeds moist. When the seedlings have their first few leaves, thin to the strongest seedling and transplant outside spaced at least 24 inches (60 cm.) apart. Transplant the seedlings in an area of sun to partial shade with rich, deep, moist soil. Lovage develops a very long taproot, so be sure to cultivate a deep bed, amending with plenty of compost. Allow the plants to have plenty of room to spread; at least 3 feet (1 m.) between plants. Lovage self-seeds easily. If you want additional lovage plants, that’s great, but if not, be sure to weed out new seedlings. 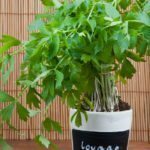 Trim lovage in the summer to encourage new, tender shoots. 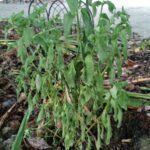 In the fall, lovage dies back. Cut the stems back to just above ground level.